Colds stink! And Daddy’s Valentine’s! And my artist! First… my blog will go back to “normal” sometime soon… I just have to find time to change it back! That, and I wanted to update my header a bit and haven’t had time to do so. So bear with me as we “extend” the CHD awareness look for a few more days! Her cough is nasty and I finally took her to the pediatrician the other day, and she has a DOUBLE ear infection!!! YUCK YUCK YUCK! And now her antibiotic is making her have yuckier than normal poop (sorry, I KNOW you wanted to know that!) so that’s great fun too. So anyway, my mommy brain just needs a wee bit of reassurance today that it is “just” a cold! Scott had a good birthday!!! He had a surprise by his brother and sister-in-law coming for a few hours to see him on his birthday (they were in town for a concert but live in NC) and then his parents drove in that day too and surprised him at dinner that evening, along with the rest of my family that lives here! It was a fun day!!! AND… Scott and I got to go on a DATE on Sunday, something we rarely rarely get, while his parents watched all the kids!!! My Lacy (almost 8) brought home a paper from school yesterday. It said that they pick 2 kids art-work out of each grade level at the school to be displayed at a special exhibit at the Frist Center in Nashville. Guess who’s art-work from the 2nd grade was picked?????? (Well, one of the two…) YUP! Lacy’s!!!!! AND! The weekend of the open house when the exhibit opens is her birthday weekend, so it will be a fun thing to go see her artwork hanging in the Frist right around her birthday! I mean, how COOL is that! Yes… I am just a wee bit proud of my daughter!!!!!! On Friday, my girls all dressed in their Christmas-turned-Valentine’sDay dresses and Daddy took them (minus Annabelle) to the “dance” at school!!!! I came later with Annabelle since I had to help out with the “flower” stand… so Annabelle was able to get her picture with Daddy too! 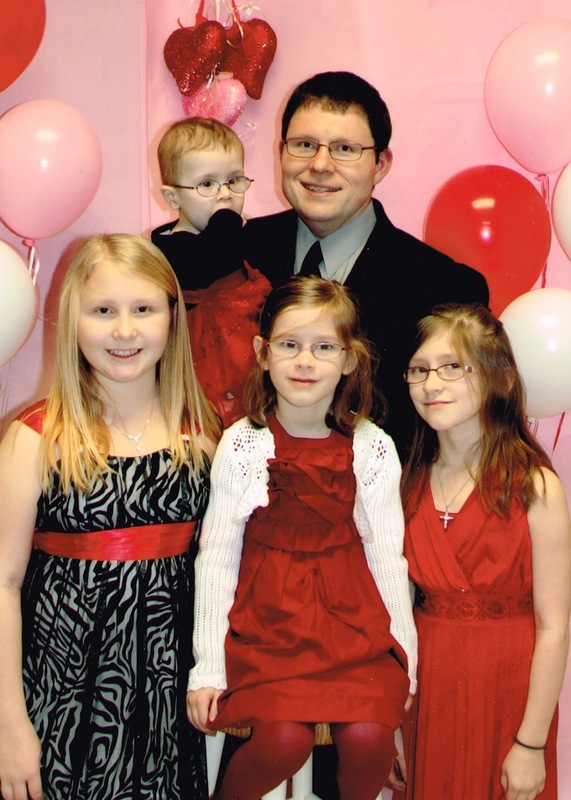 ’12 Father/Daughter Valentine’s Day Dance!!! What a great picture of a great dad and his daughters! I hope Annabelle gets well soon. Witt just went through the cold/ear infection thing. Took two rounds of antibiotics to shake it. Will be praying that Annabelle gets over it quickly. What an AWESOME picture! One to be cherished forever and forever!! So sweet! Daddy is loved loved loved loved! What a lovely post,(except the ear infection and cold).